Peter Boggis discusses what makes one organisation try out new ideas while others are content with how things are. He argues that innovation can be developed as an organisational capability and the first step is to dispel the myths about innovation. We are all creative. Individually and collectively we have an interest in making things better. Admittedly some of us are more creative than others, but it is difficult to argue that, as a species, we are not innovative. After all it is that basic desire to innovate that has got us to where we are today. Likewise, organisations – which are essentially made up of individuals – generally have a desire to innovate, to try new things and improve the way things are done. But some organisations are better at innovating than others; why is that? What is it that makes one organisation try out new ideas while another is content with how things are? Is it what’s happening in their industry that drives innovation? Or is it the style of leadership or culture that determines the capacity to innovate? It is also worth noting that innovation is a relative term and not the same as invention. The generally accepted definition of innovation is the first attempt to carry out (an idea) in practice. So what might appear to be highly innovative in one industry or organisation might be the norm in another. For example, in the UK we see the Public Sector ‘wanting to do more with substantially reduced resources’. There is much discussion about sharing ‘back-office’ functions and establishing shared service centres between adjacent local government authorities. While the creation of shared services might seem highly innovative to this sector, a global chemicals or paper manufacturing company that moved to shared service operating models some two decades ago, after recognising then that it needed to do more with substantially less, might think differently. So is being innovative simply copying what other industries or companies have done before? To some extent yes: as in the words of Oscar Wilde “never forget that your best thoughts come from others”. But attempting to simply transplant ideas can be dangerous as the ‘DNA’ of each organisation is unique and what works for GE or Shell cannot simply be transported or copied in P&G or BP. 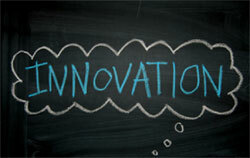 If some organisations are genuinely more innovative than others, can innovation be developed as a sustained capability? In our view, yes. Like other organisational capabilities, innovation can be developed and ‘embedded’ so that it becomes systemic and then “just happens”. A good example is Whirlpool, the global white goods manufacturer. They have been working on developing innovation as an organisational capability for over a decade and can demonstrate that some 25% of their revenue and profits come from innovative products and services that did not exist two to three years ago. Innovation – from the Latin verb innovare – means to introduce something new. Creativity is the state that people go through to generate potentially innovative ideas. In business terms we define innovation as the introduction of something new – new to this particular organisation – which can deliver tangible, measurable business value to either internal or external customers. Stimulating creative ideas – or building a culture of creativity – is of no value if those ideas have nowhere to go. A transparent, objective process for capturing them, evaluating them, rejecting many, taking others forward for experimentation and ultimately implementing a relatively small percentage of those ideas that deliver measurable business value is required. Think about innovation and you tend to conjure up images of innovative product companies like Apple, Google, P&G, etc. While it is true that innovation is central to the success of these companies, we firmly believe that every organisation can find ‘sources of value’ where innovation can play an important role. Product/service offering – the classic domain for consumer product companies. Apple, Google, P&G, Amazon and Tesco are the archetypical examples of innovation for the end-consumer. Innovation here not only comes from the product – witness Apple’s relentless array of innovative products – but also from ways in which the service is offered and delivered – witness Tesco’s Club Card or its innovative (but not yet profitable) Fresh & Easy retail formats in Western United States. Revenue models. Innovation, especially in the eBusiness space, has created radically new forms of revenue generation – from ‘pay per click’, subscription-based revenue models to advertising revenue. Operating model innovation. For decades, private sector companies have innovated around ’what gets done where‘, including shared services, sourcing strategies and procurement. Public sector organisations in the UK – including local government and the National Health Service – are now beginning to apply some of the principles (whilst not copying the exact practices) of innovative operating models to the ways in which they configure their operations and activities to be more cost-effective and more customer- or patient-centric. Where information about the product or service is as valuable, or even more valuable, than the product or service itself. GE Power Systems, Rolls-Royce and Otis Elevators have for decades realised that they know more about the performance of the products – turbines, aircraft engines and elevators – than anyone else and they can package and offer value-added services around this information to help their customers to maximise the performance of their energy plants, aeroplanes and buildings and reduce the ’mean-time to failure’. It may seem counter-intuitive to suggest that innovation requires an explicitly designed, repeatable and sustainable process in order to embed this capability in an organisation. Surely, one argues, the potential bureaucracy of a process is going to constrain the very creativity it is meant to stimulate. Not having a clear, transparent, objective, equitable channel for capturing creative ideas leads to massive dissatisfaction, employee disengagement and rapid disenchantment. Why? Because if there is nowhere for creative ideas to be channelled, no clear, objective criteria for evaluating ideas and no visibility of where they are in the process, the source of these creative ideas will rapidly dry up. If innovation is important to achieving the strategic imperatives of the organisation, then it is usually relatively easy to create a ‘clear line of sight’ between the business value of innovative ideas being evaluated and the business value delivered. While consumer products, technology and pharmaceutical companies typically commit anything up to 15% of revenues to R&D/innovation, many companies are unsure what amount of time, money and effort is dedicated to innovation – or the business value that it delivers. What we have observed as best practice is having a specific budget dedicated to the process and the activity of innovation – chief innovation officers are increasingly common as process owners with budgetary responsibility. For innovation to succeed, a culture needs to be developed that is ‘tolerant’ of a certain amount of ‘failure’, but actually the important thing is the lessons learned and never to make the same mistake twice. This tends to mean that top-down, deeply hierarchical and ‘command and control’ types of organisations foster a less tolerant approach than organisations that are flatter and have higher degrees of empowerment and engagement, and a more democratic, self-managing culture. While an innovation process can be designed fairly quickly, we should remember that changing an organisation’s culture has a long lead-time and this is probably the hardest thing to change. ‘Bleeding-edge’ technology is best left to real pioneers in the technology companies. Innovation – and technology-enabled innovation in particular – is about what is new to one organisation at a point in time. For example, when Group-ware – subsequently this became Lotus Notes – was first spotted by Swiss Bank Corporation, it was definitely in the category of ‘new and emerging technology’. But three years later, when it was first adopted by UBS – another triple A rated Swiss Bank – it had become relatively mature and proven. The DNA of one organisation and its attitude to risk cannot simply be replicated in another company – even in the same industry. While proprietary information about a company and its innovation activity rightly needs to remain confidential, we have observed a rapidly increasing trend towards innovation through collaboration. Both GE’s Jeff Immelt and P&G’s Al Laffley – interviewed together in a Fortune magazine article – recently declared that in the future, substantial amounts of innovation would come from collaborating with customers, partners, employees and suppliers in a much broader ‘eco-system’ than the self-contained environs of the company or the division itself. Al Laffley has declared that whereas in the past P&G’s R&D activity was largely self-contained, in the next three to five years, more than 50% of its innovation would come from outside the organisation. Collaborative technology platforms now support and enable far higher levels of innovation than ever before and allow companies to collaborate both internally and externally for tangible business benefit. Generali Deutschland, for example, successfully invested in and deployed Cisco’s TelePresence video-conferencing technology to facilitate the integration of two large businesses – one in Hamburg, the other in Munich – reducing the time and expense of travel and building collaborative capability that would otherwise not have been the case.